Andrei Vasilevskiy made 33 saves, Braydon Coburn and Ryan Callahan both had two assists during a three-goal second period, and the Tampa Bay Lightning beat Boston 4-0 Tuesday night to move into a tie for the Atlantic Division and Eastern Conference leads with the Bruins. The Boston Bruins missed a chance to edge even closer to a division title. 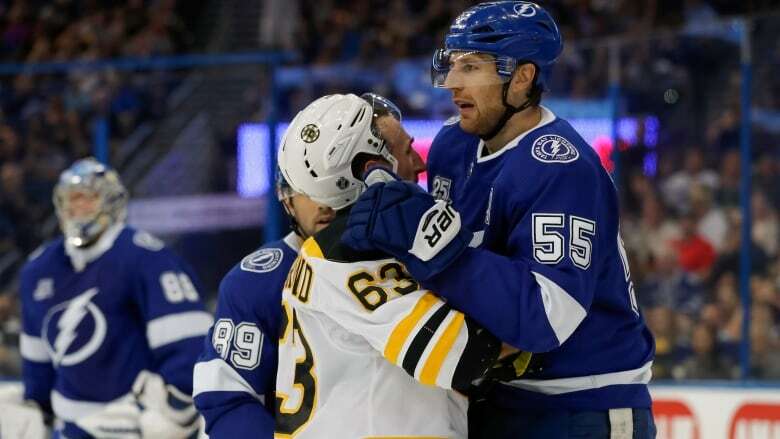 Andrei Vasilevskiy made 33 saves, Braydon Coburn and Ryan Callahan both had two assists during a three-goal second period, and the Tampa Bay Lightning beat Boston 4-0 Tuesday night to move into a tie for the Atlantic Division lead with the Bruins. "They hadn't beaten us this year, and they were determined to do that," Bruins coach Bruce Cassidy said. "The first period, I thought we were clearly outplayed for the most part. I thought the second period we didn't give up as many quality chances and three of them went in. That's the way it goes some times." Brayden Point, Victor Hedman, Chris Kunitz and J.T. Miller scored for the Lightning, who had lost four of five. "We want to finish in first place," Hedman said. "The first two periods were some of the best hockey we've played all year. I was very happy with the way we played." Tampa Bay played without star centre Steven Stamkos, who left Sunday's game against Nashville in the second period with a lower-body injury. It hasn't been announced if Stamkos will play in either of the Lightning's final two regular-season games. Tuukka Rask stopped 32 shots for the Bruins, who had gone 5-0-4 over their previous nine games. Boston has three regular-season games left. "They were definitely the better team," Rask said. Vasilevskiy stopped a breakaway shot by David Pastrnak in the second, a period that saw Point, Hedman and Kunitz all have goals as the Lightning took a 3-0 lead. Tampa Bay has outscored its opponents 109-72 during the second this season. It was Vasilevskiy's eighth shutout this season and first win (1-4-1) in six games against Boston. The eight shutouts set a franchise record. "When he's on his game, he's really hard to beat," Point said. Miller scored during a 2-on-1 break early in the third. "A complete effort by the whole team," Lightning coach Jon Cooper said. Boston won three of four in the season series.